ST. PETE BEACH, FL – A 19-year-old was bitten by a shark near her home on Wednesday. Jenna James was swimming behind her home on Boca Ciega Drive when she was bitten above the right knee. 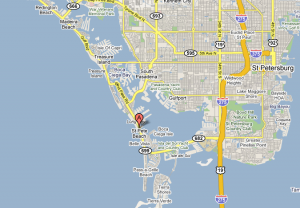 She was swimming with her sister in fairly shallow water in Boca Ciega Bay and felt a cutting sensation above her knee. “She was approximately 10 – 12 feet off the dock,” one witness told ABC Action News. James did not see the shark, but the bite wound provided the evidence. Her wounds were described as severe. James’ sister was instructed on how to apply pressure to the wound to limit the bleeding. She was taken to Bayfront Medical Center where she underwent surgery late Wednesday. The hospital is not releasing information about her condition. James is a graduate of Admiral Farragut Academy in St. Petersburg. The attack was more than enough to keep neighbor Matthew Igoe from testing his luck in Boca Ciega Bay again. “When you see it up close like this and it happenes in your neighborhood, definitely, believe me, it’s in the back of your mind at all times,” he said. Several neighbors said they see bull sharks in the water every day and that no one should be swimming there.